Bear Lake Road is a heavily wooded area that connects the Speedway and Animal Kingdom sections of the race. Some would call this stretch of the course boring, but I thought it was nice (it even included a giant Villainous meet and greet). The tree lined road is pretty, and allowed me to settle into a nice rhythm. We proceeded by the pungent (and infamous) sewage treatment plant. Eventually we made our way past the Disney tree and bush farms (where the awesome topiaries are made) and were rewarded with the greatest Chiquita bananas I have ever tasted. Yes, I was just starving by this point. I am surprised that they do not have gel stations in the first half of the marathon, and I was running low on my supply, so the bananas were amazing and could not have come any sooner for me. 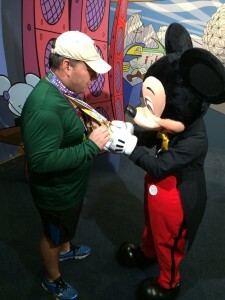 Mike visits with the official runDisney SMO inspector. This, however, was where I started to hit my wall. I was struggling a bit and the previous days’ activities and the training I missed due to injury were starting to take their toll. I forced myself to press on by thinking about what I could do to entertain myself: the roller coaster! Yes! I would ride Escape from Everest in Animal Kingdom. It has become a bit of a tradition in this race for runners to take a detour to ride a few attractions, the roller coaster being the most noteworthy one. Honestly, this thought helped get me through the next two miles. We were greeted by stilt walkers from the Jammin Jungle Parade and several cast members who had animals read to be pet and to be posed for selfies, which several runners stopped to indulge, but I was focused on Everest. We soon entered Animal Kingdom, and while the park was not yet open, several runners stopped to take pictures with some of the animals who were awake and playing. As I finally arrived at Everest, I noticed a line of runners already forming to enter the queue. I asked the cast member what time it would open, and she told me not until 9:00 am. I looked at the clock and it was only 8:39. Disappointed, I had to make a decision. Did I stop and wait? Or did I make my way down the road, figuring I could be all the way to mile 15 by the time the ride opened. In the end, I decided to press on, knowing that a 20 minute stop and standing around would make it VERY difficult to start running again and finish the last 13 miles. We made our way past the Theater in the Wild (home of Finding Nemo the Musical – Just keep swimming!) and into Dinoland USA, where I stopped to use one of the (CLEAN!) restrooms before proceeding out of the park. Again, good planning paid off. We exited through a rear entrance and made our way down a snaking roadway and out into the parking lot, where we were greeted by a smattering of spectators who really hoofed it to cheer us on at this point. I was surprised by just how spectators were out in this area, and I was appreciative of their efforts – and even more appreciative that NONE of them jumped off the curb and collided into me this year! 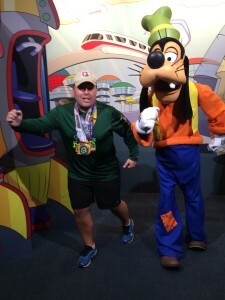 Evidently Goofy did not think that running 39.3 miles during his Challenge was quite enough. I couldn’t contain my excitement, and started to high-five and thank several of them for coming out as I passed by. UN-magical moment. A woman behind me scoffed loudly: “Is he going to thank everyone?” I knew this was aimed at me, and I thought to myself “Why yes, yes I am!” This just goes to show, never let anyone else’s negativity affect your enjoyment of a race. Mickey Mouse, dressed in his best safari gear, greeted us in the parking lot before sending us out onto Osceola Parkway. This is where I really started to struggle (miles 13-15), and I fed off of the pockets of crowd support that were scattered along the parkway whenever I could. I started playing mental games, and told myself that all I had to do was make it to mile 15, because THEN I would only have single digit miles left to go! Folks, during a marathon, MATH IS HARD! When I got to 15, I realized my error, as I still had 11.2 miles to go, but whatever, I was not giving up. We refueled at the Cliff Shots station, and I was grateful for the spectators who gave us candy and animal crackers along the way, which I think may be the greatest in-race food I have ever eaten. As I reached mile 16, I could see the crowds returning from ESPN Wide World of Sports (their mile 20-21) and making their way to Hollywood Studios. Remember how I mentioned chance and fate? Well, at this point I happened to fall into step with another runner. We chatted and had a good time. We had never met before, and didn’t discuss it, but in doing so, we were pushing each other to keep going. We hung together until we entered the Wide World of Sports complex, where I hung back to get a drink from the hydration station and to refresh myself with the wet towels runDisney provided. After 16+ miles, being able to refresh yourself with a wet towel is a wonderful feeling and is much appreciated. Feeling better and knowing I had access to Wi-Fi in the ESPN complex, I took the opportunity to create my own magical moment. I pulled out my IPhone and FaceTimed my mother and stepfather back in Ohio from the course…while I was running! They were surprised to hear from me, especially when they realized I was still running (and not walking). They have always been such huge supporters of me, and I wanted to show them my appreciation in a small way, though I am sure, from their perspective, I looked very reminiscent of the Blair Witch Project. After we hung up, I FaceTimed my sister and my young nephew, they have been equally as supportive and it was nice to talk to them for a few brief moments. I would’ve FaceTimed with the rest of my family, but they haven’t all bought-into the Apple devices the way I have. Sorry guys! 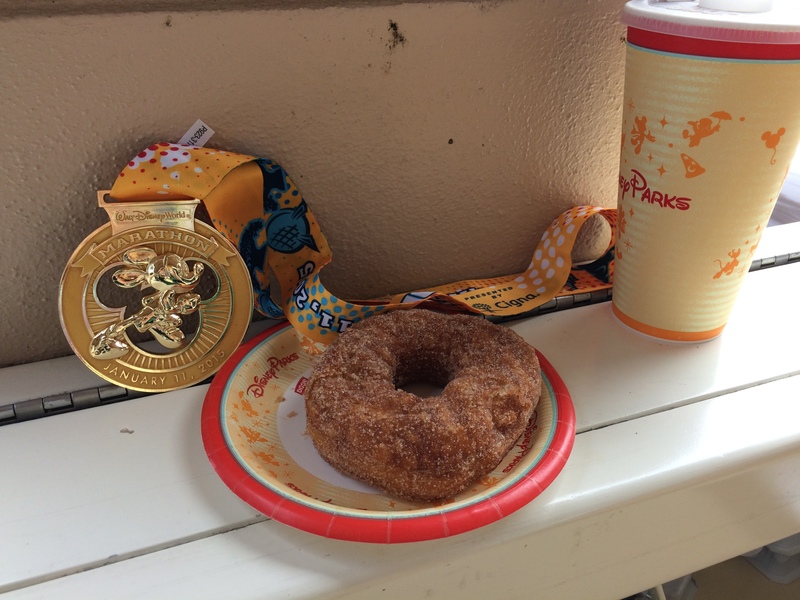 Celebrating earning this SMO with a tasty cronut. To my surprise, as I hung up with my sister, I came upon the same new running buddy I had met before entering ESPN. We paced and motivated each other wonderfully, and while we did not yet know, we would wind up finishing the race together. We made our way out onto the training track, and around the backside of the practice fields, before passing Chip and Dale on our way into the baseball stadium where…it started to rain! Don’t get me wrong, this was no Wine & Dine splash-and-dash magnitude of rain, but it was noticeable. Unfortunately, the rain kept the crowds out of the baseball stadium, and dampened (pun intended) what is usually an awesome atmosphere. We soon made our way out of the ESPN complex and were on our way back to Osceola Parkway. The rain stopped around mile 20, and so we stopped as well, but this time it was for a quick bathroom and hydration break. We were soon back on our way towards Hollywood Studios. 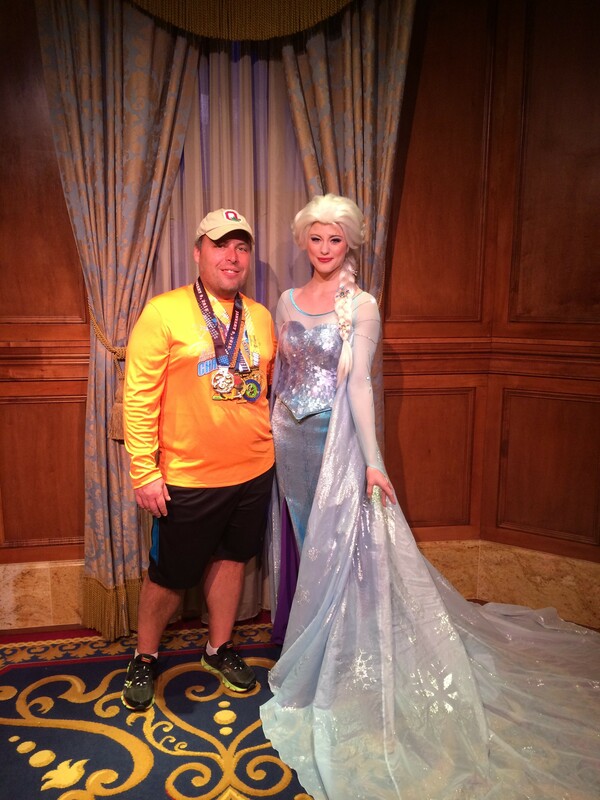 By now my new running buddy and I had tacitly agreed to finish the race together, and I told her about my plan to meet my friends in Epcot to get my medals and perhaps and adult beverage. She was more than a bit incredulous about my plan, but when I asked her for her drink order, I think she started to believe me that yes, I am really that nuts. We agreed on champagne at the France Pavilion, and once again I pulled out my phone and called ahead to Jennifer to place our order. See, I told you she is an amazing friend. 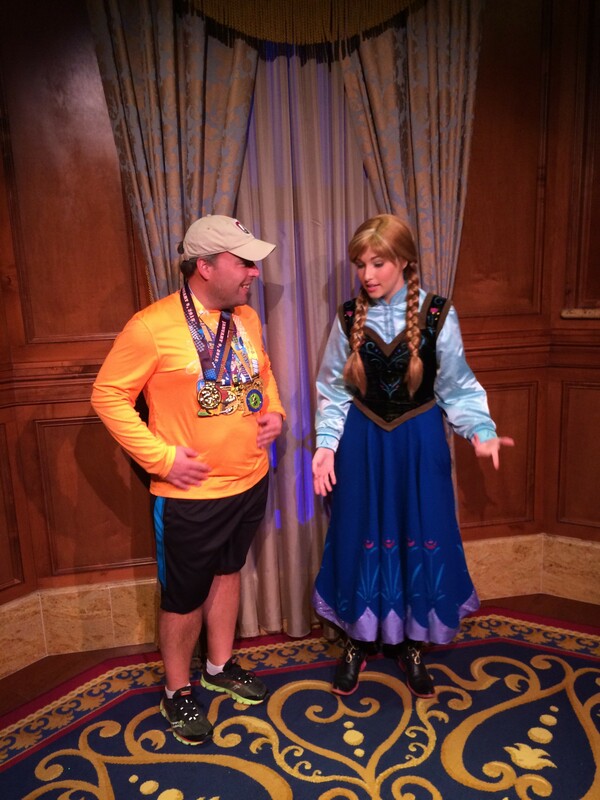 Dopey Challenge Primer: Mike tries to explain to Princess Anna just why someone would willingly run 48.6 miles over 4 days. I was amazed at how fast the miles were passing by at this point – having a great running buddy to help entertain and pace you really is priceless. Before we knew it we were entering Hollywood Studios and made our way into the backstage area past the Tower of Terror and into the disco tunnel from the now-closed Backlot Tour. As the attraction is closed and major changes are in store for this park, I am guessing that this feature may be missing from future runDisney events, so I was glad to have been able to enjoy it while it lasted. We made our way onto the streets of America, past the Writer’s Room (I really could’ve gone for a cup of coffee at this point) and out onto Hollywood Boulevard. If I have one critical thing to say about this course, it is that it really does not spend as much time in Hollywood Studios and Animal Kingdom as one might expect or like. If there is a way to shorten other aspects of the course and add more in-park time at these two places, I am sure the runners will appreciate it, I know I would. Before exiting Hollywood Studios, I did pass the Sorcerer’s Hat for the very last time – it was torn down shortly after the end of the race – and I made sure to continue the tradition I’ve taught my nephews when they leave a Disney park: I blew a kiss to the park icon and said “See ya real soon.” Sadly, I won’t see the icon ever again. Moving along…at this point in the race, you know you have it won, you know that failure is most definitely not an option. Making our way out of Hollywood Studios, it started to rain again as we entered the narrow sidewalk path along the canal to the Epcot area resorts. Unfortunately, due the rain, there were not very many spectators along this stretch, and the hydration stations became an impassible log jam (the only time I noticed such an occurrence during the entire event weekend). Soon we passed the Boarwalk, Beach Club, and Yacht Club, and made our way into a backstage area between the International Gateway and World Showplace. This is where the last “official” hydration station is located, but, with all due respect to the awesome volunteers, it would not be the last, or best. We entered Epcot’s World Showcase in the United Kingdom and turned right, making our way towards France, where I quickly found Jennifer and Jake waiting with my SMOs from the previous three days of events, and 2 long stemmed plastic champagne glasses. We greeted each other, introductions were made, and I placed the medals around my neck before we clinked our champagne glasses together in a celebratory toast. I thanked Jennifer and Jake, and we were once again on our way, strolling down the promenade enjoying our celebratory adult beverage. As we approached Morocco, we noticed that Aladdin was standing there with no waiting, so we took our picture with him. The cast member was shocked when she realized that we had not yet finished the race, yet already had drinks in hand. We laughed, finished off our drinks, made a quick fist pound, and began our run to the finish. As we passed through the rest of the World Showcase, we saw other runners stopping for their own celebratory adult beverages, including a line of about a dozen runners at the margarita stand in Mexico. As we entered Future World, the rain started to come again, and this time harder than before, but we seemed to relish in this, we would not be deterred! As we had done on the 3 previous days, we went past Spaceship Earth and ducked into a backstage area. Despite having run 48.4 miles in 4 consecutive days, sprinted down the finisher’s chute – with me clinging onto the medals that were already around my neck. As we crossed the finish line together, I was in disbelief that I had done it, that I, a person who never had any intentions of running a single half marathon, let alone a marathon, just crossed the finish line at my third marathon, and the day after I crossed the line at my thirteenth half marathon, en route to completing the 2015 Dopey Challenge. What am amazing and unexpected journey it was! There were lots of SMO’s with this one! In addition to the 3 that I already had hanging around my neck, shortly after finishing I received the marathon, Dopey Challenge, and Goofy Challenge medals. All 3 medals and lanyards were very nice and up to the usual runDisney standards of quality, however, as it was the 10th anniversary year, the Dopey Challenge medal really stood out. It was a large #10 with a spinner built into the 0, whose alternating sides featured the marathon and half marathon events. It definitely stands out in a crowded field. For the record, yes, I did wear all 6 medals around the Epcot the rest of the day…and to the Magic Kingdom the next day…and to the airport…and on the plane ride home! I earned those medals, I had every intention of enjoying them. For challenge participants it bears noting that runDisney, for the first time, did away with wrist band system and used a photo ID system to verify participants. Runners had their pictures taken at the expo, and then volunteers compared the marathon finishers to their photos (using laptops and bib numbers) prior to awarding the challenge medals. This system replaces the old wristband system (with which I had no problem) where you received a new wristband after completing each leg of the challenge. The only concern about this new system is they only verified that the finisher of the last race was the registered participant. So, in theory, this does allow room for shenanigans in the 3 earlier races. But that is a subject for a future feature. Did I mention that it was raining? A lot? Yeah, that tends to put a damper on any post-race event, but, from what I could see runDisney once again provided a quality post-race experience, but this time it was jam packed with many more spectators and families than had been at the 3 previous days’ events combined. My only concern was that the exits were not clearly marked, and, while trying to make my way to Epcot for a fast pass at the Character Spot for obligatory bling pictures, I found myself trapped in a dead end and had to walk an extra quarter to half mile to get myself righted. 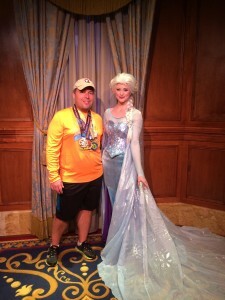 Other than that, runDisney did a stellar job with race logistics. Any time you run a marathon, you need a LOT of music, and I mean a LOT of music. I made this one an all-Disney music playlist, and featured a lot of parade and nighttime spectacular soundtrack music from the 6 American Disney theme parks. Having really enjoyed the Soundsational parade in Disneyland, I made a special point to include that soundtrack. I also added tracks from Mulan (“I’ll Make a Man out of You”), Mary Poppins (“Let’s Go Fly a Kite” and “Step in Time”), Tangled (“I See the Light”), and Brave (“Touch the Sky”) – all of which I thought were very appropriate given the challenge at hand. I am going to save my thoughts on the Dopey and Goofy challenges for a future feature, so I will focus on the Marathon event itself. Will I run it again? Ok, let’s not mess around, you know I will. I’ve done it twice already, and I love everything about this runDisney event (except maybe actually having to run miles 14-19! ), and it always finds a way to surprise. As it is the only marathon in the runDisney program, you can expect to see me back here in 2016 and beyond!